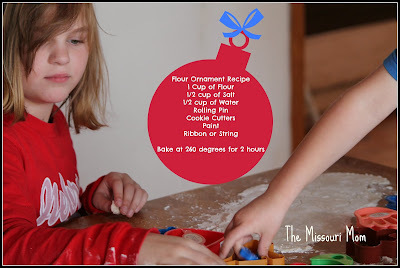 The Missouri Mom: Ideas to keep you busy during a Snow Storm. Ideas to keep you busy during a Snow Storm. This post was inspired by a fellow mom's comment..." we have to have something to do. So we choose to gain 20 lb"...She was being sarcastic, we do not choose to gain 20 pounds, but we have painfully ran out of things to do to keep ourselves busy. I too have been baking, cooking, eating, and I told the 16 year old last night before we melt out our whole house may be diabetic. I was also being sarcastic, but I am not sure I can eat another sugar cookie, chocolate covered anything, or drink another cup of hot chocolate. After 3 rowdy semi obnoxious kids got on my nerves I began searching for ideas and here a few things I had hidden away to keep us busy and not help us gain that 20 pounds. Make Christmas Ornaments - The recipe is so easy, you get the feeling of baking, and it helps heat up your home. My kids spent 4 hours yesterday rolling out dough, cutting the figures, and painting them. They loved the art work, it was very messy, but my whole house is messy so who cares. Snowflakes - now this is not anything new, but I we added a twist by using our craft scissors. I have so many snowflakes around my house it is beginning to look like winter inside. Self Pedicures - My feet look worse in the winter than they do in summer...we have wood heat and it dries my skin out. My mix is simple warm water and baby oil, then we paint our toes all pretty and pretend we are ready for summer. Plan your Future - My kids have their whole future planned out, kids named, and occupation established. They have giggled and laughed for hours over what they are going to be. Ice Cube Races - stolen from a friend's creative son. We froze colored water in our muffin pans and then the kids slid the colored cubes across the our semi frozen pond, while I watched from the front door....(note they never stepped on the pond). They thought this was a blast and we may do round 2 today. Popcorn Art - we have not broke this out yet, but may before the end of day. We string popcorn colored strings along with beads and decorate the popcorn with glitter. Name game - Write their name down and have them think of as many words they can come up with that they can out of their name....this gets tough and is great for older kids. Kids love to Draw - Kids of every age love to draw, so my 2 younger ones have filled many hours this week with drawing pics of mommy, Santa, each other, and things I have no clue what really is. Sock Puppets - An old favorite from my beloved GaGa. We use to use Grandpa's old socks, markers, buttons, yarn, and whatever to make these lovely and often talkative characters. We may break this one out today also. Button Art- I keep a bag of buttons for any button emergency. Buttons are great art tools! We make necklaces, bracelets, and all kinds of things out of them. You can also give the kids a piece of paper, glue, and let them create button people or snowmen....I love doing that also.